NOTE: This product is a Pre-Order and is not currently available. The estimated release date is September 2019 (subject to change). From a mysterious cave high in the Barrier Peaks, they come: savage raiders of unknown origin laying waste to castle and keep, leaving no survivors. The land is in turmoil and only a band of stalwart heroes dares to launch an expedition into the soaring mountains to stamp out this vile menace. What they discover in those lofty peaks is something beyond their comprehension. A danger spawned from the very stars above. A crashed starship, buried for centuries beneath the Barrier Peaks, has awoken, and now its alien inhabitantscrazed robots, eerie androids, and even stranger thingsendanger the world. The adventurers must confront these threats and navigate the unearthly interior of the wrecked starship, puzzling over and mastering alien technology to defeat their foes. If youve ever had the urge to zap an umber hulk with a laser rifle while commanding a robotic servant, this adventure is for you! 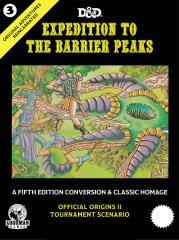 This tome is an homage to the original fantasy and science-fiction dungeon expedition that began decades ago with S3: Expedition to the Barrier Peaks. Herein you will find high-quality scans from multiple printings of the original first edition adventure module, plus commentary by gaming luminaries. A full fifth edition conversion of the original adventure is included, as well as brand new additional adventure locations and a dungeon level to expand and develop the spaceship and the surrounding environs. This is the perfect framework for a fully playable extended dungeon delve, suitable for taking your fifth edition campaign in out-of-this-world directions, with a distinct old-school vibe.